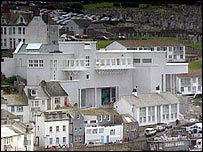 Plans for an extension to the Tate St Ives gallery in Cornwall went on display to the public on Wednesday. The Tate wants to build a new £9m gallery space and education centre on the nearby Barnoon car park. Managers say it is necessary to be able to provide exhibitions all year round, and to meet the needs of an increasing number of visitors. But some local people are opposed to the plans, saying it will ruin the town's skyline and hit local parking. The gallery was expected to attract 70,000 visitors a year when it opened in 1993, but the actual numbers are more than 250,000. The Cornish town is renowned for artists such as Barbara Hepworth and Alfred Wallis. Paul Myners, chairman of the Tate trustees, said of the plans: "What Tate St Ives has achieved so far is to reveal the huge appetite that exists for something that can reflect the unique qualities of this extraordinary landscape." Managers also said they hoped the new building would increase out-of-season trade for the town. Residents against the plans have formed the Keep St Ives Special group. They say they are not against the expansion of the gallery, but think any new building would ruin the skyline. They are also objecting because the expansion would mean the loss of about 80 parking spaces in the seaside town, whose streets are clogged with traffic in the summer months. The Keep St Ives Special group said it would mount a major petition against the current expansion plans. The plans are on display at the Guildhall in St Ives and at the Tate from Wednesday until 10 September, after which a planning application will probably be submitted in November. Building work could start early next year and it is hoped that the extension will be finished by the summer of 2007.